“Every once in a while, the Apu, or mountain spirit, will call to a cow to graze way up high on the steepest slopes, where the cow will slip and fall; by doing that, he provides food for the Andean condor.” That, explained our Shaman friend, Puma, was why there were cows grazing at ridiculously high elevations on slopes that weren’t many clicks away from vertical. 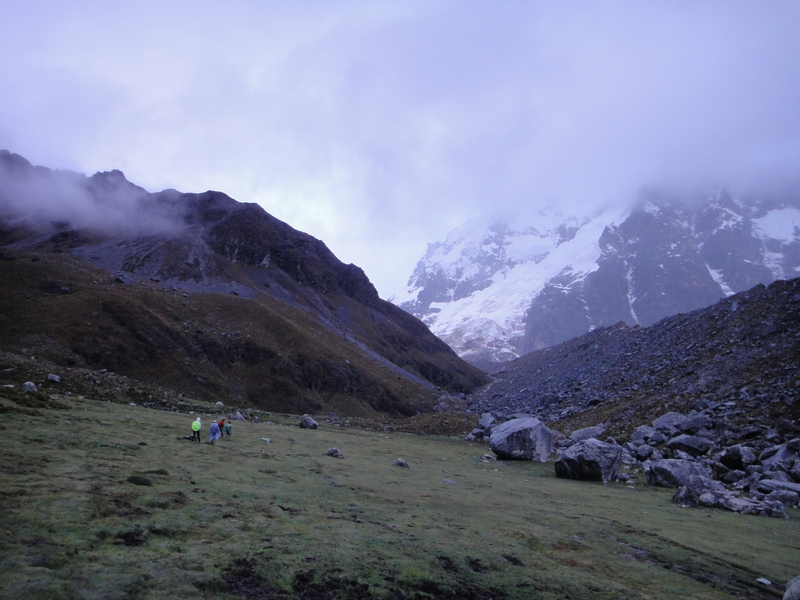 Our group of six was on a hike to “touch” the glacier, dance in the sky under a full moon, and hang out with the Apu of Nevado Salkantay, a 20,500-ft tall beast of a mountain (the highest) in the Cordillera Vilcabamba range of the Andes of central Peru. Within my 1-month trip to this fascinating country, this was likely to be my toughest test in terms of operating in thin air (Sir Edmund Hillary, I’m not): a trek from an altiplano (or high plain) on the southern flank, up to a high pass where the fringe of the mountain top glacier ebbed, and down to a tropical forest to the north. 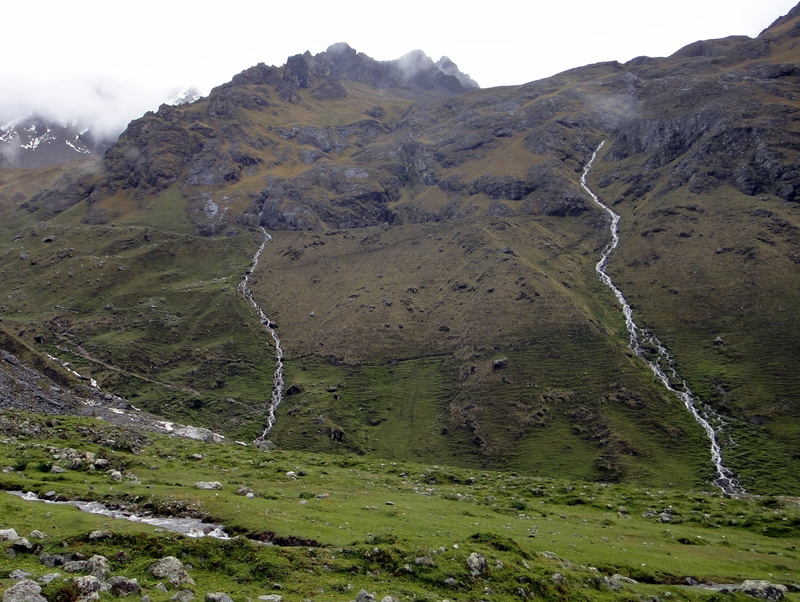 We were a ridgeline and glacial moraine or two away from the highest portion of the Inca Trail, which leads to Machu Picchu. The start of the trip had all the meteorological and logistical suspense one could hope for. It was raining on and off in the 13,000-ft high valley, and the clouds elbowing to crowd between the peaks gave us only teasing glimpses of how much grandeur was in visual range. 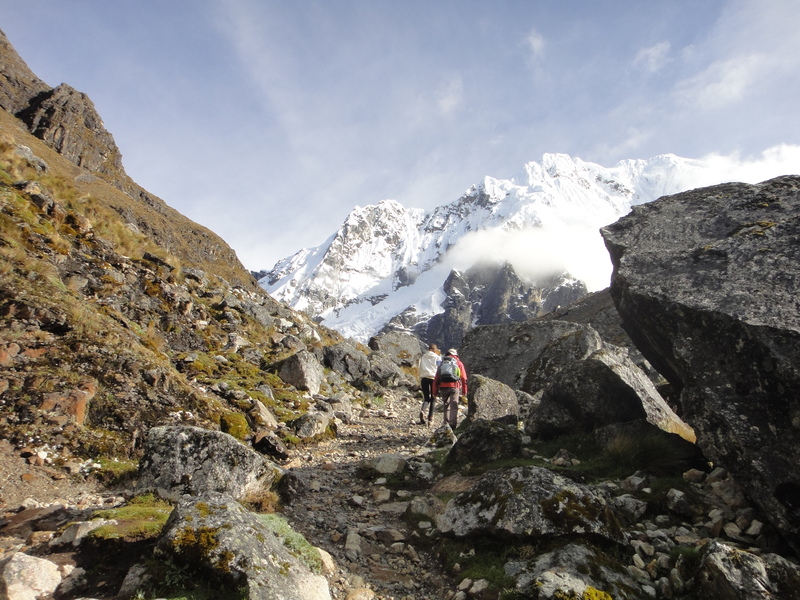 There were shutter-quick views of lower plateaus and cloud banks, glimpses of green in the lower valleys or pampas far below, and mist-impaired glances at three snow-topped mountain peaks, deceivingly seeming to be within slingshot range, Salkantay, Umantay, and Yanantay. It occurred to me that only a handful of times had I been lucky enough to be in the unusual perspective of being able to watch clouds climbing up hillsides towards me. A little seat of the pants planning meant we hadn’t lined up horses or mules to carry excess gear, and we were relieved when Francisco stepped up; the others weren’t too thrilled because it had been raining for most of the past 2 or 3 weeks, making for poor footholds for the pack animals, and miserable conditions all around for the handlers. But all of us in our party were prepared to give all due respect to the Apu of Salkantay, and to celebrate and show our appreciation really in whatever he had in mind for us. Regardless of how much the clouds blocked our view, the “streams” made their presence known from the start, their voices and instruments warming up for a concert that would last the entire trip. These streams dropped along the sides of the mountains all around us at impossibly steep angles; continuous vertical ribbons of silver that tied all the vistas together into one neatly wrapped gift for your eyes. It made me wonder if a watercourse that is solid white dropping from one precipice to the next can even be called a stream. One member of our party played the flute before we started, to wake up the Apu and let him know he’d be hosting us; the notes added the perfect melody line to the bubbling “bass” line of the streams. 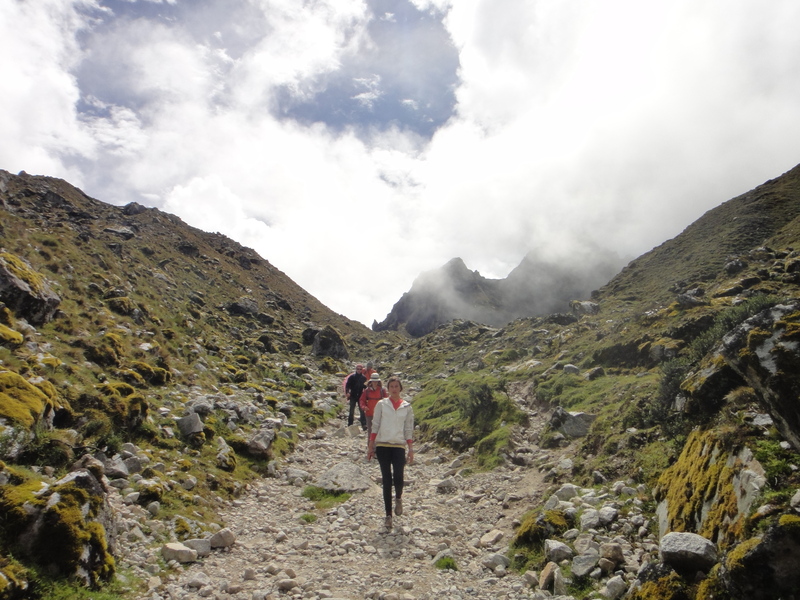 We finished our bowls of quinoa and potato soup, packed a cheek with coca leaves to try to stave off the inevitable (for me) high elevation headache, and headed to the top of the valley, with the abrupt wall that would greet us there not yet in view. By the time we stopped for the evening in the dimming light in a small alpine meadow at around 14,500 feet, my headache would be one for the ages, my chest aching from gasping for oxygen, and my clothes rain-soaked. If there had been undiscovered intact Inca ruins that surpassed Machu Picchu, and cloud-top angels dancing by strobe lights to driving latin disco music visible from that camping spot….I still would have dived immediately into the tent, gingerly piled layers on, and laid back in corpse-like stillness with newly found deaths-door religion to try to make my headache go away. Taking care to think thoughts as slowly as possible, to not anger my headache, I remembered the shaman Puma’s words from the week before when we had been on a side-bar discussion while in Andean ceremony, chatting about whether we should do a jungle hike or a high elevation hike; Puma held my wrists, closed his eyes….consulted his ancestors…and promptly informed me I needed to go higher. Laying in the tent, I wondered at that moment why Puma hated me so much. It’s a funny thing, though, when you do a trip like this and do it in the “way” of the indigenous Andean culture; you simply are guaranteed a positive experience. This approach means you appeal to, and pay respect to, Pachamama, the Apus, the ancestors… basically all of creation. You humbly ask for grace, give offerings of coca leaves and ceremonial medicine, you blow Amazonian tobacco smoke to appeal to the Apus and at the clouds to make them retreat, and play flute music to salute all beings of the Earth, walking in joy and celebration. By doing this, it’s literally impossible not to end up celebrating because you are “on alert” for a sign in response; and if you are watching, a response is inevitable. It may be a cloud that gives shade on a too-sunny day; a short sunny break on a rainy day; a visit from a bird that comes unexpectedly close and stays; a rainbow that surely is the best rainbow ever. And when you experience these things after your offerings, you celebrate doubly because not only did you see them, but YOU had something to do with their appearance! 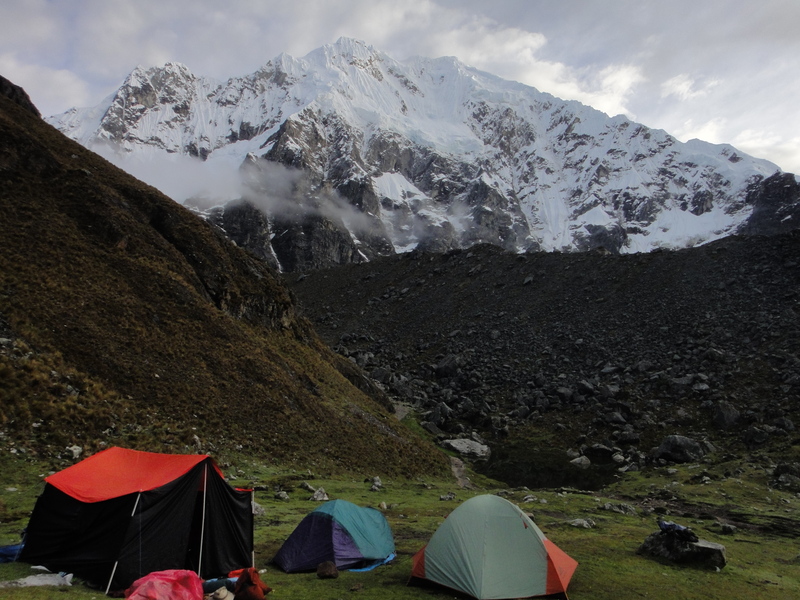 We had glimpses of the full moon throughout the night, and in the morning, we woke up early to an otherworldly wonderland of vivid white glaciers, jagged sharp rock outcrops, winding glacial moraines….and…..BLUE SKY! According to our guide, it broke a long string of lousy weather days, but was no coincidence given the gifts we had made to Apu Salkantay. A special tea concocted by our cook took care of any residual headache, and we made short business of breakfast in a race to make it up to the pass, determined to take full advantage of what the Apu had given us. 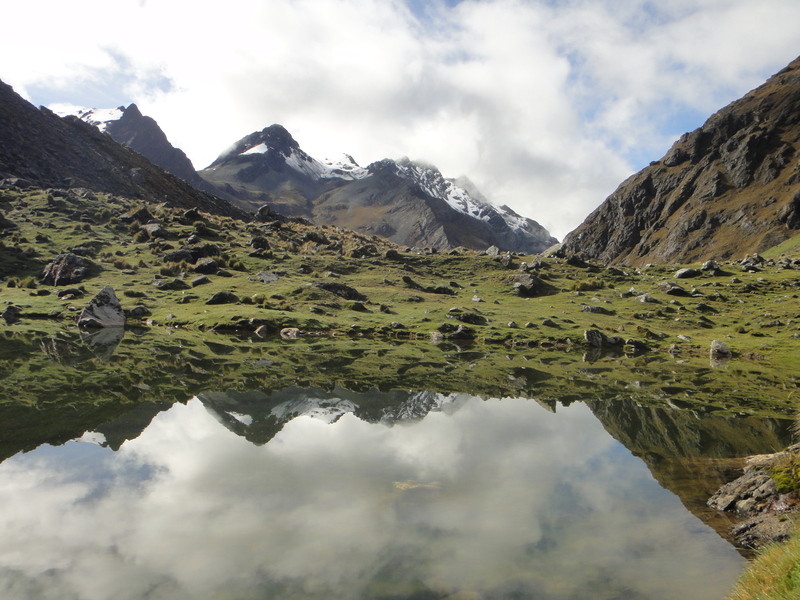 It’s difficult to describe the sensual experience of a high Andean mountain pass. The sounds and smells at 15,000 ft are…well, I guess the word ‘stark’ comes to mind. The air is impossibly clean. Think of how your nose is assaulted by the rich smells of a tropical jungle…ripe and rotting fruit, musty soils, pungent spices, animal smells of all kinds – human included -, and maybe toss in an ocean breeze laden with salt and sealife… and then take your mind as far away from that as you possibly can. That’s what it smelled like. It’s also, at least on this morning, incredibly quiet. The stream soundtrack is just a murmer at this point; across a small chasm there is one small stream that squirts out from under the bottom edge of the snowpack. There isn’t much bird song, and there are no trees, leaves, or grasses to serve as vocal chords for the steady, but soft, wind. Last night, occasional thunder that we quickly realized was avalanches all around us, interrupted our dinner and early sleep, but after a chilly night, the snowpack was holding its cards tight. Those starved senses, however, are more than compensated for by the feast for your eyes. It was 360 degrees of sublime. I’m sure the view that mountaineers get from looking down at the top of the world on the various peaks that qualify as that around the earth is quite unique and satisfying. But for me, I was satiated to the max by all that was below me, at the same level as me, and by what still pierced the sky above me. A vertical splash of paint across the canvass that was just right. We spent way longer at the pass than we’d planned; we had about 8 to 9 hours of hiking to get to our subtropical destination for the day, but it was just too perfect. 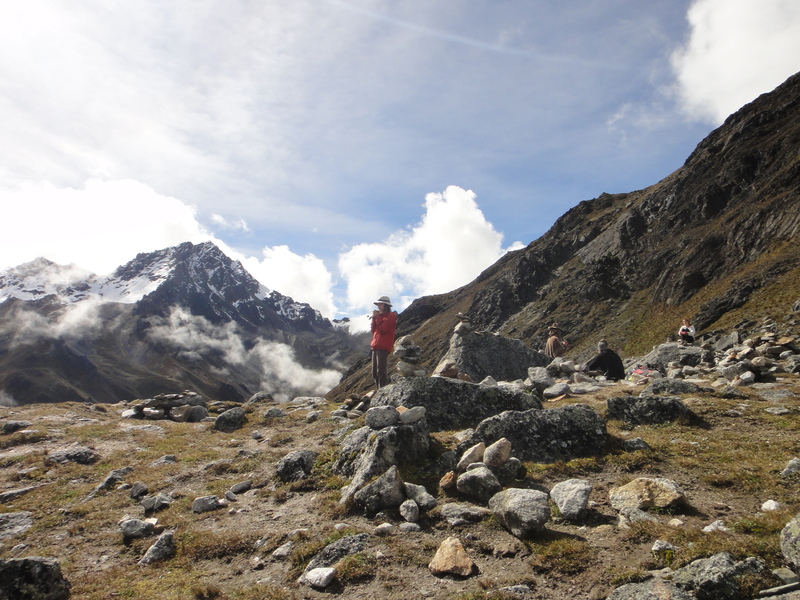 We made more offerings of coca, medicine and flute music, gave thanks to Salkantay, and asked for its guidance and strength in whatever aspect of our lives we felt could benefit. We made intentions that were witnessed by the Apu, and which therefore felt more binding than if made under oath in a court of law. The act of crossing a high mountain pass in the Andes has deep significance: when we cross the pass, we begin a new stage of our lives, we leave behind the baggage that no longer serves us, and we see with clarity from high above, equally physically as spiritually, where we are at in our lives, what may lie ahead, and how we wish to carry our selves down our life paths. During the long, and I do mean long, hike down the mountain we alternated between periods of lively conversation that celebrated our good luck, and quiet moments of introspection, digesting what it meant to each of us. I also had glorious stretches of “empty-headedness” where I thought about nothing at all, watching the alpine rocks and lichens give way to the grass and small flowering plants of the paramo, which gave way to the taller grasses and shrubs of montane shrub zone, which eased into cloud forest of polylepsis trees (short, angular branches, small leaves, peely red bark), which slowly surrendered to the dense and towering tropical cloud forest. Since the pass, we had more or less paralleled the course of that small trickle that had escaped from the foot of the glacier; it now had grown to a raging torrent of whitewater, over 50 feet wide, and crossable only on an aerial bridge strung well above flood range. I found that I was particularly struck by this feature of the trip: we essentially took the same journey the stream did, and it communicated to us its geologic history and life force that was utilized and respected by the few residents we encountered along the way (until the forest). The “Stream” – Somewhere along the middle of the hike down. The path of the stream also related a troubled environmental story. 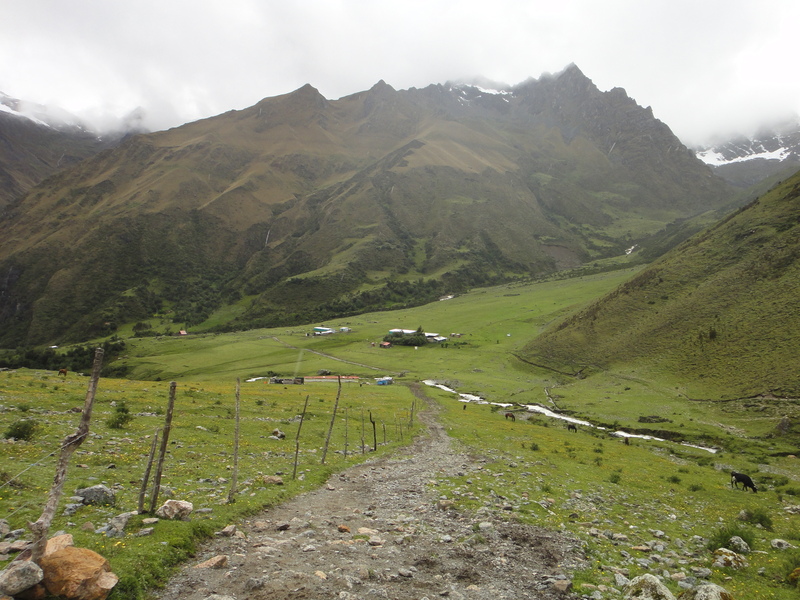 The watershed we traveled down on Nevado Salkantay was heavily grazed by cows, horses, and alpacas. All areas these animals could reach were grazed to nubs, and stones that were being exposed as the soils around them washed away were more abundant than the greenery in many places. 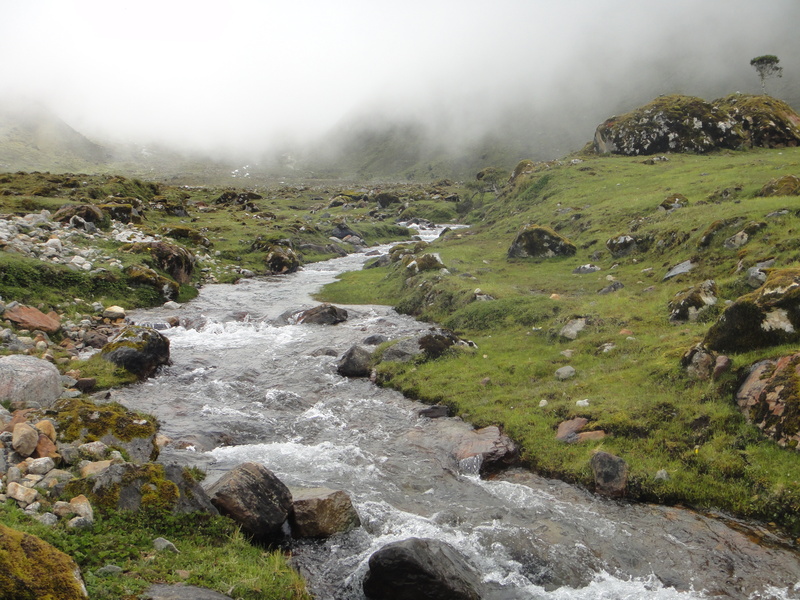 The stream also told the story of a receding glacier at the top of the mountain. 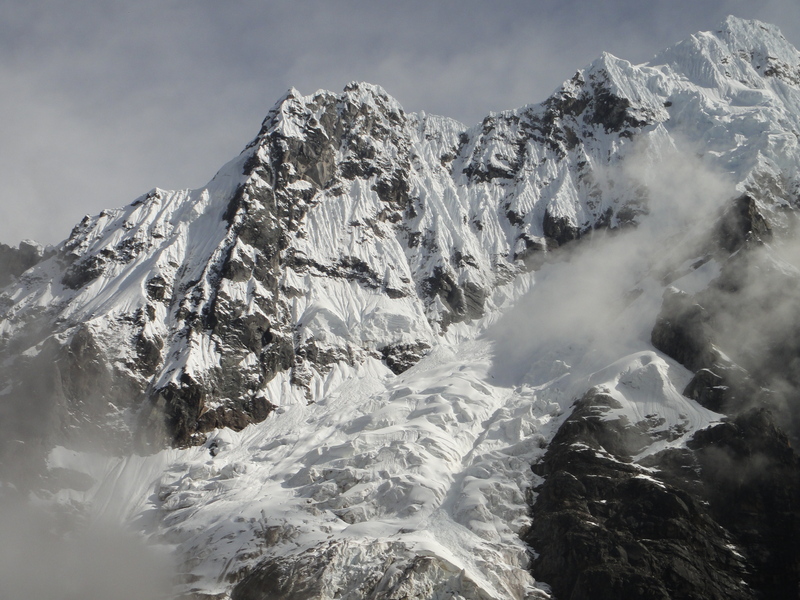 Because it sits on the western edge of the Amazon, and it benefits from a large amount of moisture that wrings out of clouds traveling on prevailing westerly winds, Salkantay and its immediate neighbors are faring better than many other Andean glaciers, which are disappearing at alarming rates, and threatening the existence of countless communities that rely on the glaciers for water. 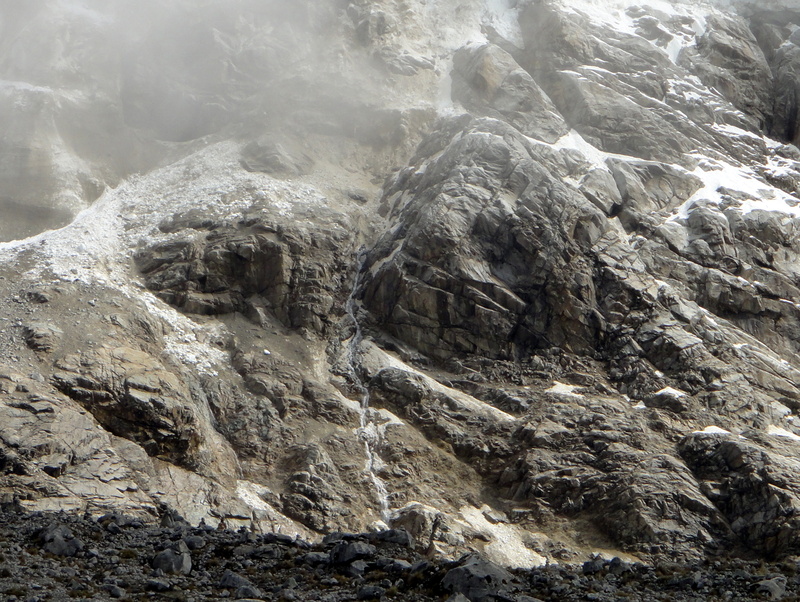 But even on Salkantay, it was obvious that the glaciers had long since vacated their terminal and lateral moraines (ridges of stone and rocks that lined where the glacier had once advanced to), and were nowhere near the cirques, kettle hole lakes and erratic boulders that once were filled or covered with snow and ice. 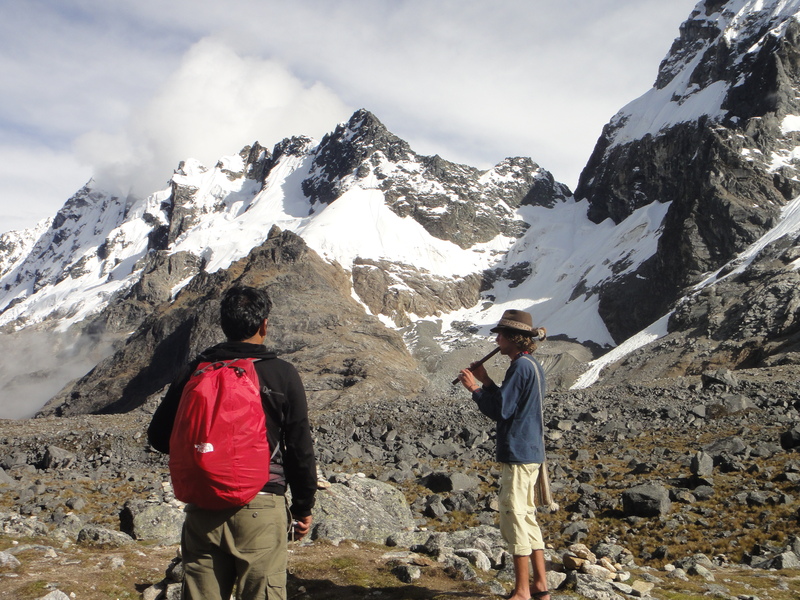 Candy wrappers, plastic water bottles, and trail erosion were evidence that Pachamama was hurting for a bit more respect. Whether it was luck, a clearing weather front that moved through just in time, or whether the Apu of Salkantay heard our flute songs and responded to our offerings, we recognized our good fortune, and one last time gave thanks for the riches we experienced, and the strength we’d carry forward. Of course, by the end of the walk down that mountain, none of that strength was apparent, as our shaky legs, blisters on our feet, and hunger pangs took front and center stage. It would take a few days to recover, no doubt, but the task was made somewhat easier when later that night we lounged in the geothermal hot springs of Santa Teresa. Peru is an amazing travel destination, with a history and culture that can only be hinted at over a typical vacation, thanks to its location as the center of the Inca dynasty. It also has a physical geography that is staggering….and as you drive along narrow winding roads that cling to mountain sides where they have no business clinging, where residents routinely take to the picks and shovels to clear landslides so they can keep getting their truckloads of Inca Kola, and where you wish that the words “guide rails” would be added to the vocabulary…you will definitely get more than a hint of its adventure potential. I hope that Andean culture, which added so many dimensions to this trip, persists for many more generations, and the indigenous of this region find a way to survive in the face of the onslaught of western culture creep and changed climates. Somewhat selfishly, I hope future travelers get to experience a trek like this not just from a physical perspective, but also from the potentially more satisfying spiritual perspective. Long live Apu Salkantay and all the other Andean high peaks; may they long give strength to the indigenous residents and travelers. 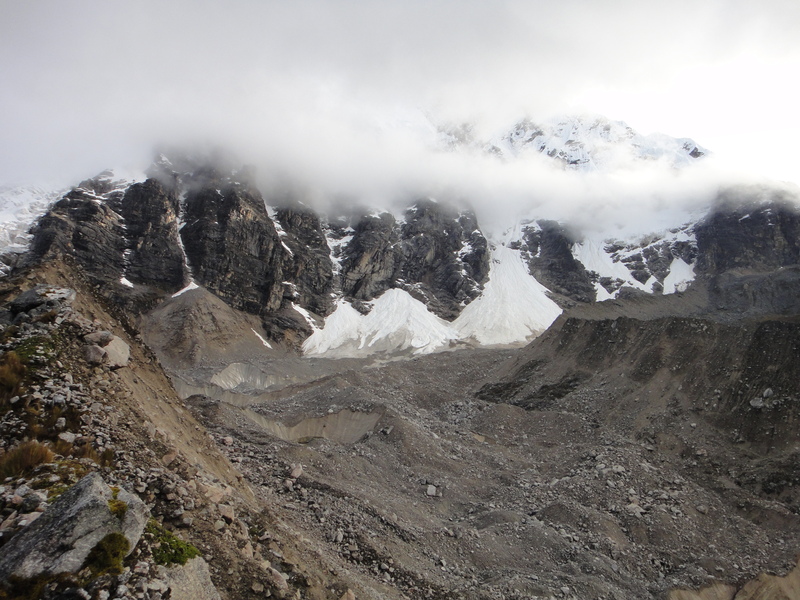 I’ll carry forward my firsthand testimonial of what a melting mountaintop glacier looks like, and some sense of how great a loss it will be when its completely gone, and for me it helps to inspire more activism in doing whatever I can to reduce my environmental footprint, and convince others to do the same. Puma’s words came back to me in the days that followed…..”You need to go higher.” I thought he was talking about elevation, but I think there was more his ancestors were prescribing for me. I sparred with my physical limits. I stretched the balloon on my spiritual faith and beliefs and gained inspiration. I added new files to my personal database of nature notes. 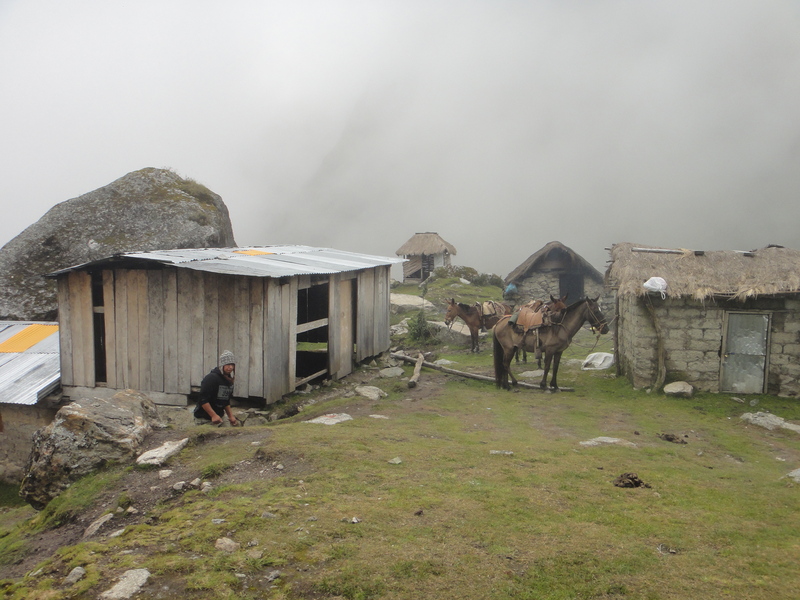 On Salkantay, I hit the jackpot for a travel experience. Very interesting story, Dave. Can’t wait to see more photos! Dave, this is a very well written piece. It sounds like an inspiring trip. Dave, thank you for keeping us informed. Your trips are an inspiration for those who would like to explore new sites, and actually, take a risk to do it. Greetings to your children.